PB: I hope Chris has not failed as badly on the technical/science side as he did on the social/political — […] most of the fuss is being made by the Americans who are on the other side of the Pacific Ocean. How unfair that the USA should suffer from the Japanese affair, they think. And also feel a level of fear, underneath all this. As perhaps they should since it is their crappy reactors that blew up. Any reactor would blow up under Stuxnet, including the best Brits’ tech. It’s not any Yankee John Doe’s fault that they have Judeocentric cabal, swarms of Shabbat-Goy lackeys and equally useful idiots at the helm of the state. It’s not their fault, either, that the Judeo-banksters’ plan to decimate Goyim with radiological warfare, bio-weapons (GMO, vaccines, chemtrails, chemotherapy…) and what not. 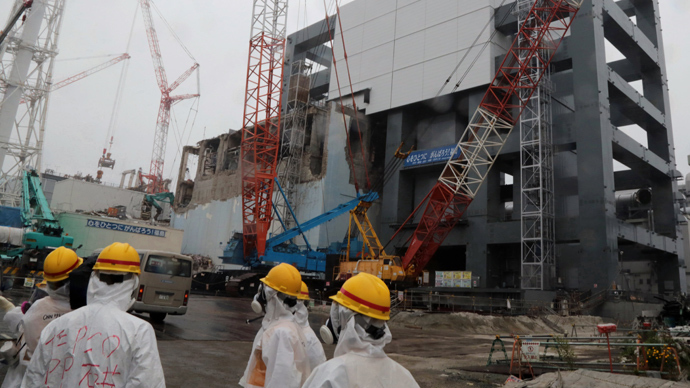 Fukushima is a nightmare disaster area, and no one has the slightest idea what to do. The game is to prevent the crippled nuclear plant from turning into an “open-air super reactor spectacular” which would result in a hazardous, melted catastrophe. On April 25, 2011 – one month after the explosions at the Fukushima nuclear plant and the anniversary of Chernobyl – I was interviewed by RT and asked to compare Chernobyl and Fukushima. The clip, which you can find on YouTube, was entitled, “Can’t seal Fukushima like Chernobyl – it all goes into the sea.” Since then, huge amounts of radioactivity have flowed from the wrecked reactors directly into the Pacific Ocean. 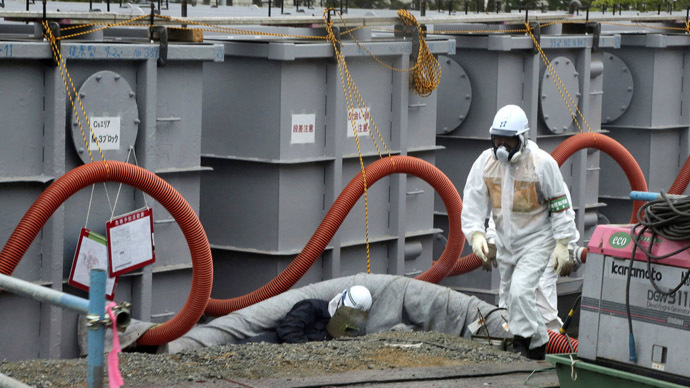 Attempts to stop the flow of contaminated water from Fukushima into the sea were always unlikely to succeed. It is like trying to push water uphill. Now they all seem to have woken up to the issue and have begun to panic. The problem is this: the fission process in a reactor creates huge amounts of heat. Of course, that is the whole point of the machine – the heat makes steam which runs turbines. Water is pumped through channels between the fuel rods and this cools them and heats the water. If there is no water, or the channels are blocked, the heat actually melts the fuel into a big blob which falls to the bottom of the steel vessel in which all this occurs – the pressure vessel – and then melts its way through the steel, into the ground, and down in the direction of China. Well, not China in this case, but actually Buenos Aires, Argentina (I figured out). I have been keeping an eye on developments, and it is quite clear that the reactors are no longer containing the molten fuel – some proportion of which is now in the ground underneath them. Both this material and the remaining material in what was the containment are very hot and are fissioning. Tepco is quite aware – and so is everyone else in the know – that the only hope of preventing what could become an open-air super reactor spectacular is to cool the fuel, the lumps of fuel distributed throughout the system, mainly in the holed pressure vessels, and also in the spent fuel tanks and in the ground under the reactors. That all this is fissioning away merrily (though at a low level) is clear from the occasional reports of short half life nuclides like the radioXenons. The game is to prevent it all turning into the open air super reactor located somewhere under the ground. To do this, they have to pump vast amounts of water into the reactors, the fuel pond and generally all over the area where they think the stuff is or might be. This means seawater since luckily they are near the sea. But they are also unluckily near the sea – since you cannot pump the sea onto the land without it wanting to flow back into the sea. Now a good proportion of the radioactive elements, the radionuclides, are soluble in water. The Caesiums 137 and 134, Strontiums 89 and 90, Barium 140, Radium 226, Lead 210, Rutheniums and Rhodiums, Silvers and Mercuries, Carbons and Tritiums, Iodines and noble gases Kryptons and Xenons merrily dissolve in the hot seawater. There is also a likelihood that the normally insoluble Uraniums, Plutoniums and Neptuniums will dissolve in seawater to some extent, because of the chloride ions. And if they don’t, the micron and nano-particles of these materials will disperse in the water as colloidal suspensions. So a lot of this stuff gets into the sea. Of course, most of the fuss is being made by the Americans who are on the other side of the Pacific Ocean. How unfair that the USA should suffer from the Japanese affair, they think. And also feel a level of fear, underneath all this. As perhaps they should since it is their crappy reactors that blew up. There are some things I want to say about all this. First is the inevitable discourse manipulation – something that we have seen in the media ever since this disaster occurred. “Decommission the plant” suggests some calm and ordered scientific process akin to shutting down and defueling an old reactor which has reached the end of its design life. It sparks images of a wise nuclear engineer in a lab coat consulting a document, discussing some issue with a worker in brilliant white overalls with a Tepco logo, wearing a white hard-hat. The reality is that this is a nightmare disaster area where no one has the slightest idea what to do and which has always been out of control. All that they can do is continue to pump in the seawater to hope that the various lumps of molten fuel will not increase their rate of fissioning. And pray. The water will then pick up the radionuclides and flow downhill back to the sea. Of course, they can put up a barrier; surround the plant with a wall. But eventually the water will fill up the pond and flow over the wall. All that water will create a soggy marsh and destabilize the foundations of the reactor buildings which will then collapse and prevent further cooling. Then the Spectacular. All this is predictable enough. Let us look at some numbers. Four hundred tons of seawater a day are flowing into the sea. That is 400 cubic meters. In one year, that is 146,000 cubic meters. That is a pond 10 meters deep and 120 meters square. This will have to go on forever, a new pond every year, unless they can get the radioactive material out. But here is the other problem. They can’t get close enough because the radiation levels are too high. The water itself is lethally radioactive. Gamma radiation levels tens of meters from the water are enormously high. No one can approach without being fried. But I want to make two other points. The first is that the Pacific Ocean is big enough for this level of release not to represent the global catastrophe that some are predicting. Let’s get some scoping perspective on this. The volume of the North Pacific is 300 million cubic kilometers. The total inventory of the four Fukushima Daiichi reactors, including their spent fuel pools, is 732 tons of Uranium and Plutonium fuel which is largely insoluble in sea water. The inventory in terms of the medium half-life nuclides of radiological significance Cs-137, Cs-134 and Strontium-90, is 3 x 1018 becquerels (Bq) each. Adding these up gives about 1019 Bq. If we dissolve that entire amount into the Pacific, we get a mean concentration of 33 Bq per cubic meter – not great, but not lethal. Of course this is ridiculous since the catastrophe released less than 1017 Bq of these combined nuclides and even if all of this ends up in the sea (which it may do), the overall dilution will result in a concentration of 1 Bq per cubic meter. So the people in California can relax. In fact, the contamination of California and indeed the rest of the planet from the global weapons test fallout of 1959-1962 was far worse, and resulted in the cancer epidemic which began in 1980. The atmospheric megaton explosions drove the radioactivity into the stratosphere and the rain brought it back to earth to get into the milk, the food, the air, and our children’s bones. Kennedy and Kruschev called a halt in 1963, saving millions. What we have here in Fukushima is more local, but still very deadly and certainly worse than Chernobyl since the populations are so large. And this brings me to my second point, and a warning to the Japanese people. The contamination of the sea results in adsorption of the radionuclides by the sand and silt on the coast and river estuaries. The east coast of Japan, the sediment and sand on the shores, will now be horribly radioactive. This material is re-suspended into the air through a process called sea-to-land transfer. The coastal air they inhale is laden with radioactive particles. I know about this since I was asked in 1998 by the Irish State to carry out a two-year study of the cancer effects of releases into the Irish Sea by the nuclear reprocessing plant at Sellafield. We looked at small area data leaked to us by the Welsh Cancer Registry covering the period of 1974-1989, when Sellafield was releasing significant amounts of radio-Caesium, radio-Strontium, and Plutonium. Results showed a remarkable and sharp 30 per cent increase in cancer rates in those living within 1km of the coast. The effect was very local and dropped away sharply at 2km. In trying to discover the cause, we came across measurements made by the UK Atomic Energy Research Establishment. Using special cloth filters, they had measured Plutonium in the air by distance from the contaminated coast. The trend was the same as the cancer trend, increasing sharply in the 1km strip near the coast. We later examined cancer rates in a higher resolution questionnaire study in Carlingford, Ireland. This clearly showed the effect increasing inside the 1km radius in the same way. The results were never published in scientific literature but were presented to the UK CERRIE committee and eventually made it into a book which I wrote in 2007 entitled, “Wolves of Water.” Make no mistake, this is a deadly effect. By 2003, we had found 20-fold excess risk of leukemia and brain tumours in the population of children on the north Wales coast. The children were denied of course by the Welsh Cancer Intelligence Unit that supplanted the old Welsh Cancer Registry – which had been shut down immediately after the data was released to us. We did publish this in scientific literature. Nevertheless, the sea-to-land effect is real. And anyone living within 1km of the coast to at least 200km north or south of Fukushima should get out. They should evacuate inland. It is not eating the fish and shellfish that gets you – it’s breathing. And what about the future? The future is bleak. I see no way of resolving the catastrophe. They will either have to pour water on the wreckage forever, and thus continue to contaminate the local sea, or find some more drastic immediate solution. I was told that US experts had the idea at the beginning of bombing the reactors into the harbour. Not so stupid in my opinion. That at least may enable them to get sufficiently close to the pieces to pick them up, and should also solve the cooling problem. Apparently (my contact said) the French argued them out of it because of the negative effect on nuclear energy (and Uranium shares).